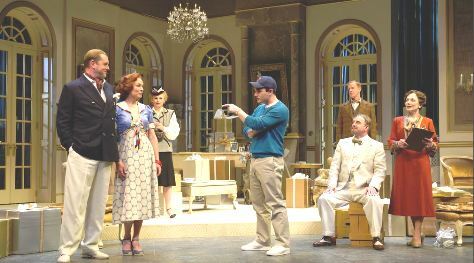 Playwright Philip Barry makes a mockery of the upper classes in the Philadelphia Story. First produced in 1939, and made into an award-winning movie starring Katherine Hepburn, Cary Grant and Jimmy Stewart, it’s a wonderfully written spoof on life at the top—a well-crafted sermon on the amorality of affluence and a celebration of life without limits. It’s entertaining, thought-provoking and funny. Major Cast members of THE PHILADELPHIA STORY, interacting There needs to be some desperation, some drive, and some need to connect. The characters don’t fully understand themselves or each other—yet long to form real relationships. The interactions between many of the actors in this production didn’t seem to gel. Ric Reid steals the show with his over-the-top antics, as William Tracey, the boozing, bored, well-connected skirt chaser. His cynicism, wit and devil-may-care attitude skillfully capture the mood of the American upper crust at the end of the Great Depression. Every time Reid appears on stage he brings a realistic, comedic breath of fresh air to the pretentious preparations for a society wedding. Reid’s appeared in countless productions over the eleven seasons he’s been with the Shaw and he’s always been good—but he’s never shined brighter than as Uncle Willie—charismatic, larger than life and wiser than any of Shakespeare’s fools. He did have great lines to play with. Philip Barry’s script is a stunner—understated, well-plotted, structurally ingenious and insightful. The fool really does have the most fun role—with the possible exception of the bride’s younger sister, (& Uncle Willie’s buddy), Dinah Lord, played by Tess Benger. Her presentation was every bit as fresh as Reid’s. She brought the stage to life every time she appeared. Sherry Flett was entirely convincing as the society lady—trying to reign in her rebellious younger daughter (Benger). And Gray Powell was a believable charmer coaxing his ex wife into remarrying him. William Schmuck outdid himself with this set design. It’s symbolic, stately and evocative of another age and time. The ribbons descending from the ceiling are celebratory of a wedding without being obvious or intrusive. The sense of majesty and mystery are so effectively conveyed in the colours, shapes and tone that they take the audience’s breath away. The contrast between outside/inside, upper and lower alter seamlessly as the stage rotates around on a wheel symbolic of the wheel of life. The upper and lower classes—the inside and outside of social acceptance—are mirror images of each other rotating around on the common base of our humanity.